Homeostasis refers to the mechanisms by which the body maintains a relatively constant internal environment regardless of changes in the external environment. For example, heat production by the body needs to balance heat loss. If this balance is not maintained the body temperature becomes too high for normal physiological processes to occur. The cells and tissues of the body are dynamically functioning. Maintaining homeostasis requires the body sensors to detect changes, then compare them to the normal value within an integrating centre (control centre), and then cause effectors to return the body to the normal value. The normal value is termed the set point. We describe this sequence of events as a feedback loop. 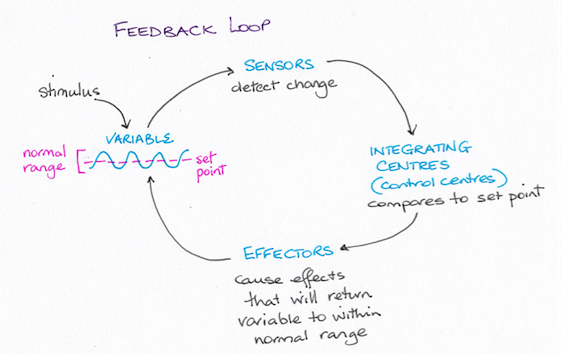 In a feedback loop the item being monitored is termed the controlled condition, for example, body temperature. Anything that causes it to change is termed the stimulus. If one or more body systems fails to maintain their values within the normal range then a homeostatic imbalance occurs. Most physiological systems in the body act to maintain homeostasis through negative feedback loops. If the measured change moves away from the set point the body uses effectors to bring the value back to the set point. That is, negative feedback loops return the body to the normal range for a particular variable. Body temperature does fluctuate over a 24 hour period as heat is produced by all metabolic processes, food intake and muscular activity. It may too be effected by the external environment. Core body temperatures are lowest in the early hours of the morning and highest in the late afternoon and evening. Heat production must balance heat loss to maintain the body temperature within a normal range of values: 36.0 to 37.5 degrees Celsius. ​Another example is cardiac output, where negative feedback loops act to maintain a normal output in order to supply tissues with oxygen and nutrients and remove the waste products of cellular respiration. Positive feedback loops move the variable away from normal. Some positive feedback mechanisms are important for body function however others can result in damage. Positive feedback loops can be the result of a faulty physiological process that leads to further disease. ​An example of a useful positive feedback loop is in childbirth. Uterine contractions have the effect of causing more uterine contractions in order to expel the baby from the uterus. These contractions stop once the placenta is delivered. Fever is another example of a positive feedback loop. Fever occurs in response to the release of toxins by bacteria and the triggering of the inflammation process. In inflammation immune cells release chemicals (cytokines) that cause the thermoregulatory centre in the hypothalamus to raise the body’s temperature set point. This is the body’s way of attempting to control the bacterial reproduction rate. Bacteria that make us ill (those that are pathogenic) reproduce optimally at the normal body temperature. When the inflammatory response subsides the hypothalamus will return the set point back to normal. Fevers regulated by the hypothalamus do not usually go above 41 degrees Celsius. If the body temperature becomes unregulated and the temperature rises towards 44 degrees Celsius then survival can become at risk as cellular components and processes can be damaged. Another circumstance that can lead to impaired control of body temperature is a spinal cord injury at the level of T6 or above. This failure in the control mechanism is due to the hypothalamus not being able to direct the effector organs for skin blood flow changes or sweating. If the temperature drops too low, such as in hypothermia, then metabolism slows down. Another example is when a body experiences uncontrolled blood loss and so blood volume is decreasing, resulting in the tissues becoming starved of oxygen and nutrients. The body responds to decreasing blood volume by attempting to increase cardiac output in order to compensate and return oxygen and nutrient flow rate to normal for the tissues. To do this, it increases the heart rate and the force of contraction while also causing vasoconstriction to increase venous return to the heart. ​However, if the blood loss in not stopped then progressive shock results. The increased cardiac heart rate increases the blood loss and eventually the heart itself fails to receive enough oxygen and nutrients to enable it to contract. This leads to the heart being unable to pump blood – it fails. Porth, C. (2011). Essentials of Pathophysiology. Philadelphia: WK|LWW. Fig 3.8. Cree, L. & Rischmiller, S. (2001). Science in Nursing. Harcourt. MacKenna, B.R. (1997). Illustrated Physiology (6th Edn). Elsevier.